Look, you know we love pompoms—just maybe not at baseball games. Saturday was PomPom Night at Land Shark Stadium in Miami for the Marlins-Dodgers game, and as you can imagine, you give 25,000 sun-baked Floridiots baseball fans pompoms, chaos will ensue. It seems that during the game fans pulled the silver streamers off the pompoms and showered the field with &apos;em, creating massive distractions for the home team and visitors alike. The Marlins&apos; Dan Uggla called the situation "brutal," his even more eloquent teammate John Baker thought it was "absolutely brutal." But whatever it was, it wasn&apos;t the craziest ballpark fiasco in baseball history, because we&apos;ve got the 5 Worst Ballpark Promotions in History here. • The Dodgers were down 2-1 when they forfeited their game against the Cardinals in the 9th inning after fans rained souvenir balls on St. Louis&apos; outfielders. Just a thought for stadium security: If you&apos;re gonna take the plastic bottle caps off the beers you serve &apos;cause you don&apos;t want folks tossing stuff on the field, maybe you ought not provide the fans with projectiles that are, oh say, 20 times the size and weight of a bottle cap? • During World War II, the New York Giants gave hundreds of school kids free admission in exchange for bringing in scrap metal to help with the war effort. Sounds good, right? Small problem: Somebody neglected to tell the kiddies there are nine innings in a baseball game, so when the rug rats rushed the field after the 8th, the umpire called the game in favor of the visiting Boston Braves, even though they were losing 5-2. • Philanthropy is one thing, but giving away actual cash in public is almost always a bad idea. Especially when you drop it out of a helicopter on a bunch of 5-12 year-olds. You can probably guess the outcome: The 12-year-olds kick the ever-living crap out of the 5-year-olds; the older kids get fives stained with cotton candy, the younger ones get trips to the hospital. 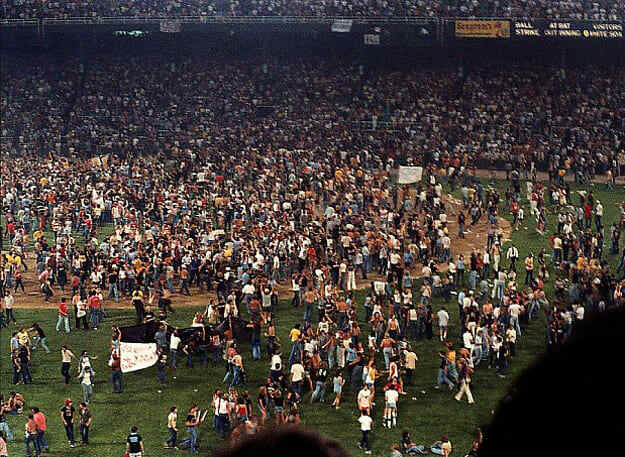 • The second game of a scheduled doubleheader between the White Sox and Detroit Tiger was called off when fans got a little carried away with breaking/blowing up their disco souvenirs. Was it the thousands of records that doubled as frisbee-scythes or the massive explosion of disco paraphernalia in centerfield? Whatever the case, it wasn&apos;t the last time disco would show survival skills that even a cockroach would envy.